connecting largo to belleair over the intercoastal waterway. A Pinellas County Deputy initiated a traffic stop on the Belleair Causeway Bridge Tuesday evening about 9:30 pm. Upon stopping the vehicle, the driver exited the vehicle and jumped over the bridge railing. Members of the Pinellas County Sheriff’s Office Patrol Unit, Flight Section, and Marine Unit actively searched for the subject throughout the night. Also assisting in the search was the US Coast Guard, Florida Fish and Wildlife, Clearwater Fire & Rescue and Largo Fire Rescue. According to the Sheriff’s Office, the traffic stop was initially conducted on the vehicle for Unlawful Speed. The deputy did make initial contact with the white male driver and returned to his patrol car. While the deputy was researching the information, the subject then jumped over the railing. An extensive search was conducted but the suspect remains at large at this time. Deputies has developed various leads as to the suspect’s location and are actively following up on them at this hour. The suspect is described as a white male, approximately 25-35 years old, and was wearing blue jean shorts and a tan shirt. In addition, he possibly has multiple tattoos. He was driving a 2005 Dark Blue Dodge Durango. Deputies have arrested the man who spent nearly 24 hours on the run after jumping off the Belleair Causeway Bridge on Tuesday. Robert Tebow, 34, was found in South Pasadena late Wednesday. Tebow had been stopped for speeding around 9:30 p.m. Tuesday. While a deputy checked his license and registration in his cruiser, Tebow darted from the Dodge Durango he was driving and vaulted over the bridge railing. Jail records show Tebow has an outstanding warrant in Douglas County, Georgia, related to a charge for selling methamphetamine, as well as an outstanding Pinellas County warrant for boating under the influence. A manhunt that included a boat and helicopter and units from Florida Fish and Wildlife and the Coast Guard couldn't locate Tebow immediately after the jump. Tebow is charged with fleeing police, providing a false name to officers and driving with a suspended or revoked license, a felony. He remained in the Pinellas County Jail on Thursday morning. 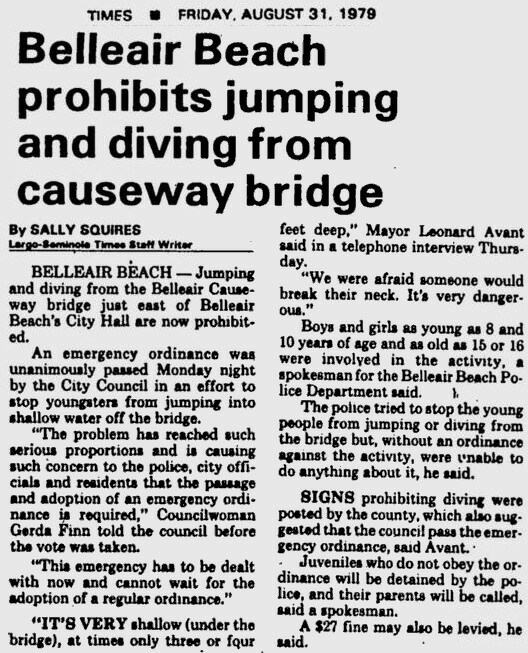 08.31.79: sorry, no more jumping from the belleair causeway bridge.